The winter landscape in Iceland is unique and unexpected! During this tour we will be seeking the best light with a special focus on the aurora borealis and ice caves, which are only available in the winter months, along with the Jokulsarlong Glacier Lagoon and famous Ice Beach. Winter is the only time when the sun sets behind the glaciers that have been stranded on the Ice Beach at low tide, and these glaciers make great images as seen below. The first tour from November 30-December 7 is full. I am arranging a second tour from December 9-16. All of the pricing, terms and conditions remain the same. Upon arrival at Keflavik International Airport take the FlyBus, which will take us quickly and directly to our hotel in central Reykjavik. We will meet at 7 pm in the lobby and then go out to enjoy a delicious meal at a nearby restaurant. During dinner we will review the itinerary and spend the first night at The Fosshotel in Reykjavik. After breakfast we will be picked up by bus from the hotel and travel east along the black sand beaches of the south coast. On your way you will photograph two of Iceland‘s most picturesque and popular waterfalls, Seljalandsfoss and Skogafoss (shown at right). Seljalandsfoss is a narrow and tall fall with a drop of 63 meters and offers the added chance of actually walking behind it for a unique angle. At a drop of 60 meters and with a width of 25 meters Skogafoss is one of Iceland‘s highest and most scenic falls, which can also be shot from above. There is a pathway to the top and further upstream additional spectacular falls can be found. On sunny days the spray from Skogarfoss can produce a double rainbow. We will then travel towards Reynisfjara Beach near the charming village of Vik, at the southernmost part of the mainland. This beach, with its dramatic scenery, may be the most beautiful in Iceland and certainly one of the best for photography. It is riddled with black pebbles and by the shore you‘ll see an impressive basalt columnar pyramid called Gardar. Further out the rugged basalt sea stacks rise mightily to the sky. The waves on this beach are some of the strongest in Iceland. After a great day of shooting this fantastic scenery, we will spend the night in Vik at the Katia Hotel. by Skaftafell with mighty glaciers and glacier tongues, black sand beaches, magnificent mountains, and icy glacial lagoons such as Jokulsarlon. As if this scenery wasn’t enough, we will always be watching for the aurora borealis. Shooting the Northern Lights in this otherworldly and adventurous setting is a dramatic experience. At the time of our winter tour the Northern Lights are extraordinary and soft, resulting in spectacular photos. Also at this time of year, you are likely to enjoy the benefits of fresh snowfall, adding yet another great touch to your images. Overnight at Hali Hotel. On this day you will have plenty of time to explore the icy wonders of the beautiful Jokulsarlon Glacier Lagoon on the east of Vatnajökull, photographing the multitude of glistening icebergs floating towards the ocean and the ice crystals scattered on the black sands. You may well spot seals in the area, as they frequent the beaches in winter. We will start our photography excursion before sunrise as the best images are captured as the first and last rays of the sun illuminate the glistening ice, creating a fantastic display of colorful light. Other lagoons can be found nearby, which are well worth exploring and photographing in their own right, as well as many breathtaking glacial outlets. 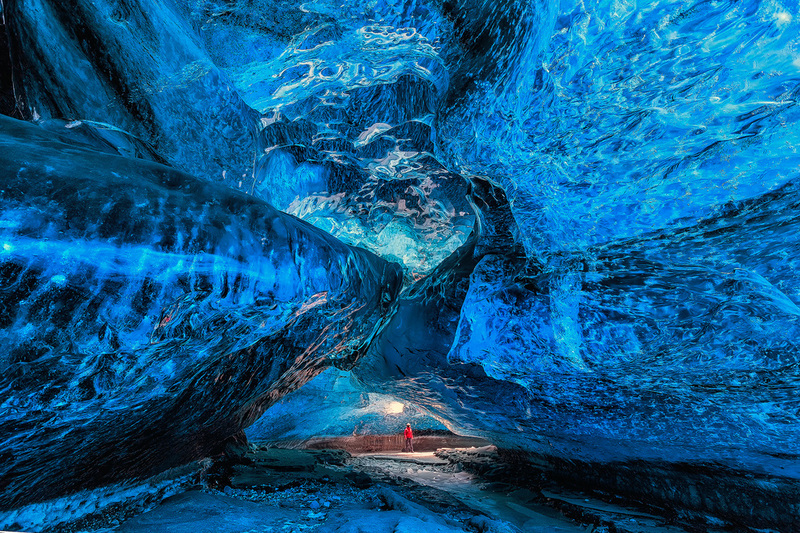 The highlight of the day, however, will surely be when we enter the sub-glacial ice caves--uniquely shaped natural sculptural cavities of crystal blue ice, located under the vast Vatnajökull Glacier. This is a moment where time quite literally seems to stand still and you will feel small and in awe with nature´s creation. Be prepared with your wide-angle lens because this is a moment you’ll want to capture well and one that will result in compelling images. Overnight at Hali Hotel. On the fifth day of the Winter Tour you will head further east to explore the majestic Vestrahorn mountain, which rises 454 meters above the black lava beach of the Stokksnes Peninsula. This steep mountain is interesting geologically, as it consists of unstratified plutonic rock, mostly gabbro, but with some granophyre as well. The mountain has a very interesting shape, consisting of several steep peaks, and one particularly oddly shaped outcrop called Brunnhorn, located to the east and stretching all the way out to the sea. All of this results in great landscapes, coupled with the mighty waves of the North Atlantic crashing into the shore. As our journey progresses we will constantly be following and seeking the best possible light, particularly sunrises and sunsets as they offer an amazing displays of light over this epic mountain. Overnight at Hali Hotel. On this day you will spend your time photographing the wonderful landscape of the Skaftafell preservation area, at the southwestern part of Vatnajökull National Park. There is fine vegetation in the area, but the largest attraction is probably Svartifoss waterfall. The whiteness of the fall contrasts dramatically with dark hexagonal basalt columns and the sharp rocks at the base which have broken from the columns. This scenery served as an inspiration for the columnar structure of Hallgrimskirkja church in Reykjavik, as well as the ceiling of the National Theater. Sculptor Richard Serra also drew upon the columns for his sculpture piece Milestones, situated in Videy, off the shores of Reykjavik. Another highly picturesque fall is also nearby, the beautiful Hundafoss. The volcanic peaks of Kristinartindar form an impressive backdrop to the scenery and more glacial lagoons can be found in the area, as well as the iconic glacial outlet Svinafellsjokull. Later you will get to shoot the fantastic scenery of the volcanic Reynisfjara beach as the sun is setting. This dramatic scenery, with Reynisdrangar protruding to the sky and meeting the strong waves of the North Atlantic Ocean. The beaches have black sand and the basalt columnar pyramid of Gardar, with its rich bird-life takes on an extra splendor in the last rays of the setting sun. Some of the most scenic photographs during the workshop are likely to be taken at this location. You will then spend the night in the charming little village of Vik, the southernmost village of Iceland, at the Hatla Hotel. Your last in Iceland can be considered a culmination. On this day you will experience three of Iceland‘s most popular attractions, which together comprise the famous Golden Circle. These consist of Thingvellir National Park, Gullfoss waterfall and the Geysir geothermal area in South Iceland. Thingvellir is considered one of Iceland‘s most important and unique locations. It has been designated a World Heritage Site by UNESCO and was the site of the old national assembly Althingi, founded in the 10th century. Iceland’s present parliament in Reykjavik still bears the same name. Thingvellir is a rift valley where the North Atlantic and Eurasian tectonic plates meet, as evidenced by the impressive Almannagja gorge with the beautiful waterfall Oxararfoss spilling into it. Thimgvellir is indeed one of the most unusual and photogenic sites in all of Iceland. The geothermal area of the spouting hot spring Geysir gives its name to hot springs or geysers all over the world. 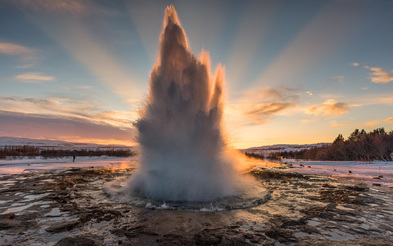 While Geysir itself is hardly eruptive anymore, its powerful neighbor Strokkur certainly is, spouting water to a height of 15-20 meters every 5 minutes. Northwards you’ll find of fumaroles (hot springs emanating steam and gas) with bright yellow stains of native sulfur that have crystallized in the steam. And to the south you’ll find a range of mud-pots (fumaroles that boil through the surface water). Not far off is an old natural pool, which can be entered but visitors need to be mindful that it is delicate. Finally, you might want to check out the nearby charming old wooden church. This colorful area offers incredible diversity and many opportunities for stunning photographs. Last, but not least, the thunderous waterfall Gullfoss is widely considered to be the most beautiful in Iceland; its name indeed translates to “The Golden Waterfall”. It is located in the Hvita Glacier River in South Iceland and drops of 32 meters into a narrow river gorge. This waterfall is a dream come true for landscape photographers. You may even be close enough to feel its spray on your face. After experiencing the “big three” of Iceland's natural attractions, you will again overnight at Reykjavik Lights Hotel. Transfer to Keflavik Airport for flights home. On this last day you will board the FlyBus from your hotel to Keflavik International Airport for return flight to the U.S., taking memories and photographs from an unforgettable adventure. The cost for this tour is $4600.00 per person, double occupancy. A single supplement is $650.00. A non-refundable deposit of $800.00 is required with registration. Payment in full is due 75 days prior to departure--September 15, 2018. This tour will be limited to 12 participants and non-photographer spouses or friends are welcome. A professional photography guide from Iceland. Transportation in a spacious and comfortable bus with ample room for photography gear. Each person will have two seats. All accommodations in hotels and guesthouses, quiet rooms and private bathrooms. All meals from dinner on the first day to breakfast on the last day. A recommended packing list will be sent out prior to departure. Travel Insurance and Medical Evacuation insurance, which are highly recommended.